I’m definitely the kind of person who accidentally leaves the lights on…as I’m leaving town for 10 days. Oops. But smart light bulbs are here to help me (and fellow forgetful electricity-wasters) out—because with Belkin’s WeMo LED smart bulbs, you can turn my lights off (or on) from anywhere in the world. 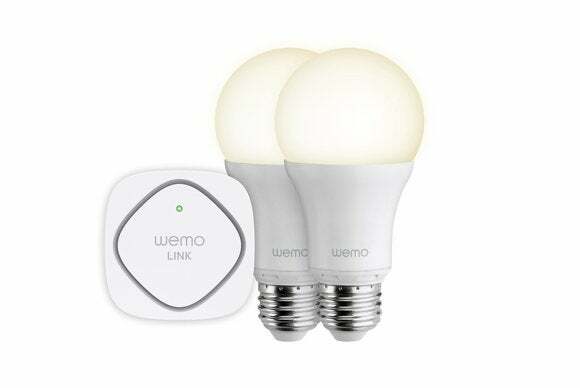 Belkin’s WeMo LED Lighting Starter Set costs $100 and comes with two smart LED bulbs and a WeMo Link, a small, white connector that plugs into your wall and lets you control your smart bulbs over Wi-Fi. Additional bulbs can be purchased for $30 each, which is about 10 times the price of a 60-watt CFL bulb, but on par with other smart bulbs (Philips Hue Lux bulbs cost $30 too). The WeMo smart bulbs give off warm, bright light similar to that of a 60-watt incandescent bulb, and have a life expectancy of 23 years, based on 3 hours of daily usage. The company claims that these may be “the last light bulbs you ever buy,” but I hope that’s not true—in 23 years, I’ll only be 50. Setting up the WeMo LED Lighting Starter Set is—jokes aside—almost as easy as replacing a light bulb. The box comes with a printed quick-install guide, but you can also download the WeMo app (available on Android and iOS) for an onscreen walkthrough. First, you plug in the WeMo Link—it’s a bit larger than your average phone charger and will definitely obstruct any outlets below it. The Link needs to be in a relatively central location in your home, because it needs to be able to access both your Wi-Fi signal and the smart bulbs it will be controlling. Not sure if your Link is central enough? Pull out your smartphone (or tablet) and check its Wi-Fi signal—if you have two bars or more, you’re good. One Link can control up to 50 smart bulbs, which should be plenty for the average American household. How many nerds does it take to screw in a lightbulb? Hopefully just you. After you plug in the Link, you should install the smart bulbs. The smart bulbs are normal bulbs, so installing them is a simple as…screwing them in. You will want to make sure that the lights are all switched on, and remain that way, so you can control them from the app. If you haven’t already, you should now download the WeMo app, which will walk you through the rest of the process. You’ll connect the WeMo Link to your Wi-Fi network by connecting your smartphone to the WeMo network, and then logging into your Wi-Fi network through the app. Once that’s done, your Link will automatically detect all of the smart bulbs in the area. You can install the app on multiple smartphones and tablets, so everyone in your household will have access to the lighting controls. The WeMo Link will populate the app with all of the installed smart bulbs (in this case, the two that came with the starter kit), giving them handy, descriptive names such as “Lightbulb 1” and “Lightbulb 2.” To rename the bulbs, go to More (the three dots in the upper-left corner of the app) > Edit Device and choose the bulb you want to edit. Here, you can rename the bulb or reset the device; in the future you’ll also be able to edit the bulb’s icon. To check which bulb you’re editing, tap Check Bulb, and the bulb will flash three times. The WeMo app works a little better on iOS than on Android, but you could use either. The amount of control you have over your new smart bulbs is actually pretty impressive, and similar to what you get with the Philips Hue Lux bulbs. From the main screen of the WeMo app, you can perform basic light bulb-type functions: You can turn the bulbs on and off, individually, by tapping the power symbol next to their device names. You can also tap on the device names to find more options, such as brightness adjustment (from 1 to 100 percent, in 1-percent increments) and a sleep fader, which lets you set the bulb to fade over a period of time (between 1 and 60 minutes). In the Edit Device screen, you can create groups of bulbs by holding and dragging devices on top of each other. Groups can be handy if you have a chandelier or a series of lights you want to control together. However, once a bulb is in a group, you’ll no longer be able to adjust its brightness without adjusting the entire group’s brightness, unless you remove that light from the group. The WeMo app also lets you create schedules, called rules, for each connected device. For example, or you can program a porch light to turn on at sundown and off at sunrise. The Rules screen lets you tweak everything from final brightness to fade-in and fade-out times, so you can program your lights to slowly (or quickly) wake you up in the morning. One premade rule called “Away mode” automatically switches lights on and off daily to trick strangers and/or potential burglars into thinking you’re home when you’re on vacation. Rules are where buying into Belkin’s WeMo ecosystem really pays off, because you can connect your various WeMo devices and have them work together. For example, if you have a WeMo Netcam, you can tap into its motion sensor capabilities to have your lights turn on when you enter a room. Like other WeMo smart devices, the smart bulbs will eventually connect to IFTTT, for even more specialized control. IFTTT is a service that works with social networks and other Internet-based alerts to trigger actions—in other words, you’ll be able to use Internet-based alerts to control your lights. You could set up an IFTTT recipe that turns your lights on whenever you check-in to your apartment building. At the time of this review, the WeMo bulbs are not yet compatible with IFTTT (though other WeMo components are), but Belkin promises that IFTTT compatibility isn’t far off. If you’re interested in controlling your lights via Wi-Fi, Belkin’s WeMo LED Lighting Starter Set lets you do so at a relatively competitive price. While the WeMo app is full-featured and gives you extremely precise control over your lighting setup, these lights are perhaps best suited to people who are interested in home automation, rather than simple convenience. I say this because the lights aren’t compatible with Belkin’s physical switches, and having to open up an app every time you want to turn on your bedside lamp can get tiring. They’re also not yet compatible with IFTTT, while Philips’ Hue bulbs are. These bulbs perform solidly and integrate seamlessly into the rest of the WeMo ecosystem. Energy efficient bulbs are easy to set up. Lots of ways to customize the lighting. No option to pair with a physical switch. Android app is a little laggy compared to the iOS version.